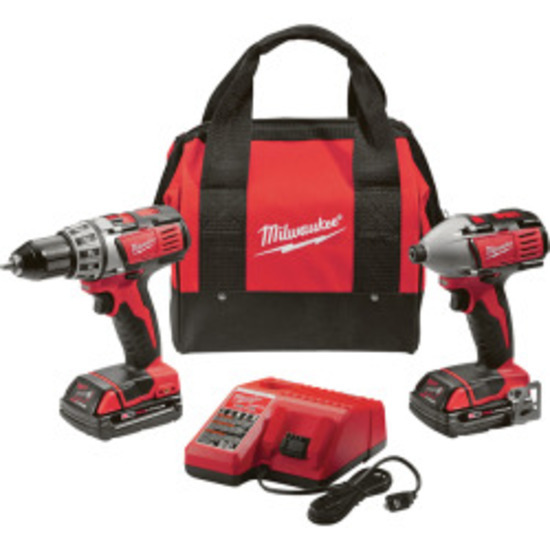 Milwaukee '2691-22' M18 Cordless Drill and Impact Kit , UPC: 045242159338 , Condition: Appear New and Unused ; Items in this lot may be new, overstock, store returns, open box, damaged, incomplete or expired product.All lots are Sold As Is, Where Is. All Sales Are Final.Sample images are representative of the types of products in this lot. Actual images are provided if available. Estimated retail values and the number of items in a lot are believed to be accurate, but this information is not guaranteed. Bidders must use the lot description as the most accurate description of lot contents.No refunds, No Returns, and No Exchanges. There are no bid cancellations. Auction items are not inspected and not tested unless stated in the lot description. Shipping Instructions: Buyers are required to request shipping or to arrange their own shipping. Shipment handling is $2.50/lot plus materials and preparation costs. Maximum handling fee is $150 per invoice. SHIPMENT REQUESTS ARE REQUIRED WITHIN 2 DAYS OF THE AUCTION CLOSING. AFTER BUYER RECEIVES THEIR SHIPPING QUOTE, A RESPONSE IS REQUIRED BY THE NEXT BUSINESS DAY. BUYERS CAN ACCEPT THE GATE 5 QUOTE, ARRANGE THEIR OWN SHIPPING, OR ABANDON SHIPMENTS. IF A RESPONSE IS NOT RECEIVED, THE SHIPMENT WILL BE CHARGED TO THE BUYER AND SHIPPED TO THE ADDRESS ON FILE. SHIPMENTS ARE NOT INSURED. GATE 5 IS NOT RESPONSIBLE FOR ERRORS WITH THE SHIPPING ADDRESS. Buyer arranged shipments: Gate 5 provides weights and dimensions. Ground shipment: Buyers must provide shipping labels by the next business day. Freight shipment: Buyers must provide the Bill of Lading and shipping documentation within 2 business days. If buyers do not provide the shipping information, Gate 5 will consider the lots abandoned. Preview Date & Times: *Please check back for any changes or additions. Driving Directions: Drive to the warehouse Logistic Edge 3963 B Workman Mill Road Whittier, CA 90601 *Check in at the security gate. Your name must be on the list at the security gate. Gate 5 Capital LLC Terms and Conditions Please review the following Terms & Conditions (referred to herein as the “T&C”) prior to completing the registration process. The T&C represent an ongoing contract between you and Gate 5 Capital, LLC (“we”) and govern your use of the bidding website. Please note that your use of the Website constitutes your unconditional agreement to follow and be bound by these T&C. If you do not accept these T&C, we kindly request that you refrain from registering on the Website. Gate 5 Capital, LLC. reserves the right to update or modify these T&C at any time without prior notice. 10% Buyer’s Premium will be applied to ALL Purchases (no exceptions). AUCTION INFO: This is an ONLINE ONLY AUCTION. Each auction listed on the Website describes in full detail the terms and conditions for that specific auction. Please review the specific Auction details and terms before registering to bid in any auction to ensure that you fully understand the auction format, including, but not limited to, the viewing dates, pickup dates, removal dates, etc. Gate 5 Capital, LLC. kindly requests that you refrain from bidding if you are not able comply with the auction’s terms and conditions. We encourage you to inspect the items in person. These items are consigned from a national retail chain Returns department. Some items may be damaged, missing parts, used, returned, overstocked, discontinued and seasonal items. Gate 5 Capital LLC conducts an open house inspection for you, the buyer to come and inspect in person prior to bidding. These items are located at the facility located in the auction description at the designated preview time. We do not allow bid cancellations or bid withdrawals. ALL ITEMS ARE SOLD AS IS, WHERE IS without warranty or guarantee. No refunds will be given. No Returns and No Exchanges. Gate 5 Capital LLC reserves the right to reject any and all bids for any reason. REMOVAL DATES: ITEMS NOT PICKED UP FROM THE WAREHOUSE ON THE PICKUP DAY OR ARRANGED FOR SHIPPING FROM THE WAREHOUSE WITHIN 48 HOURS OF THE CLOSING OF AN AUCTION WILL BE CONSIDERED ABANDONED AND RELOTTED FOR A FUTURE SALE IF YOU ARE NOT ABLE TO PICK UP YOUR ITEMS during any auction’s scheduled removal times, we would advise you to refrain from bidding in that particular auction. Items that have not been picked up by the end of the scheduled removal dates will be considered abandoned, and a removal fee will be assessed for the disposal of those items. BUYER’S PREMIUM: A 10% buyer’s premium will be automatically added to each purchase on the Website. The buyer’s premium is calculated based on the subtotal before taxes and before any discounts are applied. As an example, if you bid $100.00, you will be charged $110.00 plus tax upon checkout. PAYMENT: Accepted forms of payment include Visa or MasterCard, Discover, Cash prior to any merchandise being removed or shipped from a warehouse. Checks are not acceptable forms of payment. Please ensure that you have a sufficient credit balance available on your credit card for your online purchases. After the auction you will be sent an e-mail with a total of the items you have won. CURRENCY TYPE: USD STAGGERED CLOSING: Some (not necessarily all) of online auctions close at staggered intervals (for example, one lot per minute). This feature works to closely emulate a 'live' auction. Please review the details page to confirm if the auction you are registering for has a Staggered Closing and adjust your bidding strategy accordingly. DYNAMIC CLOSING: Some (not necessarily all) online auctions feature Dynamic Closing. The Dynamic Closing feature enables the closing time of an item to be automatically extended an additional 2 minutes whenever a bid is placed within the last minutes of the item's closing time. WINNING BIDDER NOTIFICATION: If you have successfully won an item or items, you will be contacted by e-mail ONLY. Please be sure to check your email inbox, including the spam folder, for the email notification. If you feel you have won an item and have not received an e-mail, you must notify us by e-mail no later than 9:00 a.m. pacific time the next day. If you do not receive a paid e-mail invoice, then your bids were not high enough to win any items in that particular online auction. In the event an item is not available for pickup, you must notify Gate 5 Capital., onsite staff and file a claim by replying to your original emailed invoice noting what was not available within 24 hours of the pickup date. After 24 hours, Gate 5 Capital. and you agree that no adjustment or refund will be made. SALES TAX: Sales tax will be collected based on the local and state tax rates. IMPORTANT: TAX EXEMPT STATUS - If you are tax exempt, prior to the conclusion of the online auction you must DOWNLOAD and email a copy of the appropriate states tax exempt form to Gate 5 Capital LLC and include your bidder number and the closing date of the auction. Forms without this information will not be accepted and you will have to apply to the state for a refund. DISCLAIMER: For demonstration purposes, various items may be joined. Do not assume a lot consists of more than one (1) item simply because they are connected or pictured together. Please inspect the lot numbers and read the descriptions. NO refunds or chargebacks will be granted due to a lack of BIDDER UNDERSTANDING. For any questions, please contact us. CATALOG INACCURACIES: You are bidding on the described item, not necessarily on the item(s) shown in the photo(s). Occasionally, the wrong photo is displayed, and/or a sample image is used. Please read the item description carefully. The descriptions are believed to be accurate, but this is not guaranteed. There may be slight variances. Gate 5 Capital will not be responsible for any errors or omissions in the description of the merchandise. Bidder agrees that everything is sold “As Is” and that they may not return any item they purchase. WARRANTY & CONDITION OF ITEMS SOLD: All items are sold 'AS IS, WHERE IS”, with NO WARRANTY expressed or implied by the lot number affixed to the item. This sale is to the business community as 'equipment' & 'inventory' without any implied or expressed warranty. Descriptions are believed to be accurate but not guaranteed. If you are not certain of the condition or use of an item, please bid accordingly. You are bidding on the described item, not the photo. Buyers are responsible for their own removal of items. ITEMS NOT PICKED UP FROM THE WAREHOUSE ON THE PICKUP DAY OR ARRANGED FOR SHIPPING FROM THE WAREHOUSE WITHIN 48 HOURS OF THE CLOSING OF AN AUCTION WILL BE CONSIDERED ABANDONED AND RELOTTED FOR A FUTURE SALE. Removal shall be at the expense, liability, and risk of the buyer. Purchases will be released upon presentation of a paid receipt. Please insure that movers or anyone picking up items on your behalf have your paid receipt at the pickup location. A paid email receipt will not suffice. IMPORTANT: Gate 5 Capital LLC will have the option of reselling, removing, storing or abandoning, at the expense and risk of the buyer, items not paid for and/or removed within 48 hours of the closing of the auction. The buyer agrees to pay all deficiencies, legal fees, collection fees, transportation fees and storage expenses associated with delinquent accounts or abandoned items. CHOOSE WISELY: Gate 5 Capital LLC wants all bidders to enjoy a good deal, and most will. When in doubt about the item’s condition, completeness or suitability for intended use, please bid accordingly. Gate 5 Capital LLC. reserves the right to add or remove items from any of the auctions; split or combine lots; add minimum bids or reserve prices; cancel, suspend, extend or reschedule an individual item and or auction event; make changes to the auction closing times or inspection or removal times. Any controversy or claim arising out of or relating to this contract and/or agreement, or breach thereof, shall be settled by arbitration in accordance with the Commercial Arbitration Rules of the American Arbitration Association, and judgments upon the award rendered by the arbitrator(s) may be entered in any court having jurisdiction thereof. Venue will be Washoe County, Nevada. LIABILITY: Gate 5 Capital liability shall be limited to the refund of buyer’s purchase price. LIABILITY WAIVER: I, the buyer acknowledge that this Accident Waiver and Release of Liability (AWRL) will be used by Gate 5 Capital LLC and the sponsors of the event in which I may participate. The AWRL will govern my actions and responsibilities at the event and on the premises of the event. In consideration of permitting me to participate in this event, I hereby take actions for myself, my executors, administrators, heirs, next of kin, successors, and assigns as follows: (A) Waive, release and discharge from any and all liability for my death, disability, personal injury, property damage, equipment or vehicle damage, property theft or actions of any kind which may hereafter occur to me or my traveling to and from this event or while on the premises of, THE FOLLOWING ENTITIES OR PERSONS: Gate 5 Capital LLC and facility location owners, each companies directors, officers, employees, volunteers, representatives and agents, the event sponsors and even volunteers, and (B) indemnify and hold harmless all entities and or persons mentioned in this paragraph from any and all liabilities or claims made by other individuals or entities as a result of my actions during this event. I understand the AWRL applies to any assistance provided by previously described PERSONS and equipment or supplies used during loading and unloading of any product into my vehicle, trailer, rental vehicle, rental trailer, or any sub-contracted vehicle, trailer, or equipment. This AWRL shall be construed broadly to provide a release and waiver to the maximum extent permissible under the applicable state and or federal law. CREDIT CARD POLICY: Gate 5 Capital LLC requires that you use a valid credit card to set up a bidding account. By registering with your credit card, you, the purchaser agree to the following credit card terms: 1. I, the buyer hereby authorize the auction company (Gate 5 Capital LLC) to charge my credit card that I have set up my bidder account with, for the full amount of my bill, if I do not settle my unpaid account within 2 business days of the auctions ending. 2. I, the buyer, understand the terms of the auction including pickup and payment dates and timelines, and agree that I have placed bids with the intent of abiding by the auctions set terms and conditions. 3. I, the buyer, have been given the opportunity to inspect the items in person and understand the auction company is selling the items in AS IS, WHERE IS, condition. 4. I, the buyer, hereby agrees to authorize the auction company to charge my credit card for my purchases in the event that I do not show up to pickup my items in person and make other payment arrangements. I also agree that the auction company is not responsible for handling, moving or storing the items I have purchased and that I risk the chance of those items being stolen or damaged if left behind. 5. I, the buyer, hereby agrees to not challenge or deny payment to the auction company for purchases made with the credit card that I have placed on file with the auction company. I fully understand the terms and conditions of the auction and hereby agree to this Credit Card Policy or I will not place bids with this auction website. LIMITATIONS: The above-stated T&C cannot be altered except in writing by Gate 5 Capital LLC.